The theme for our last Moveable Feast was elevated casseroles - perfect for a cool fall day where all you crave is comfort food. 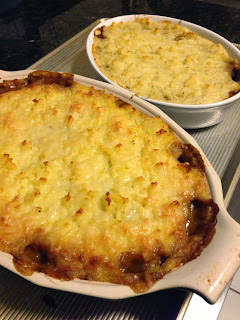 After doing a little research I found a recipe by Daniel Boulud for Beef Bourguignon Shepherd's Pie which fit the theme perfectly. I mean, how could you go wrong with something from Daniel Boulud? 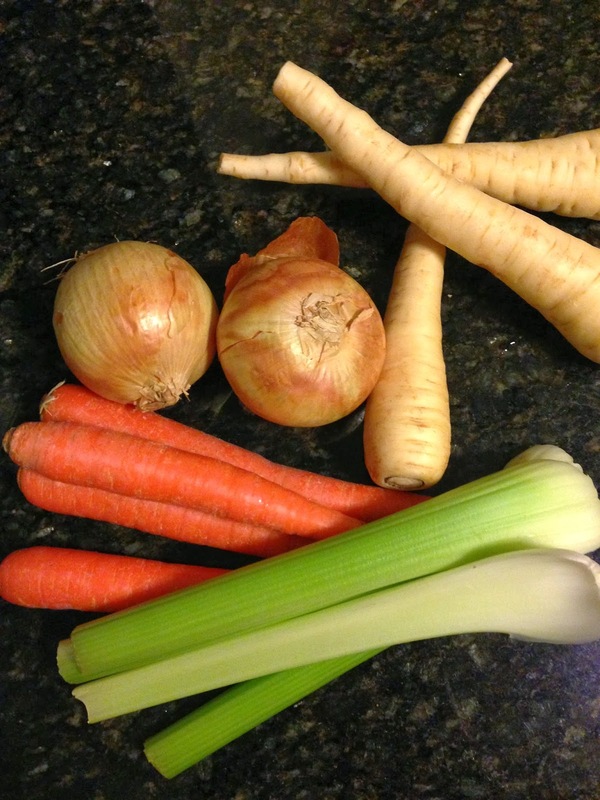 The recipe was relatively easy compared to other things I've attempted for Moveable Feast. I've made it again since our Feast and am planning to make it for my family this weekend. The recipe starts with some really good cuts of beef marinated in red wine for three hours (what could be bad). The recipe calls for boneless rib eye. 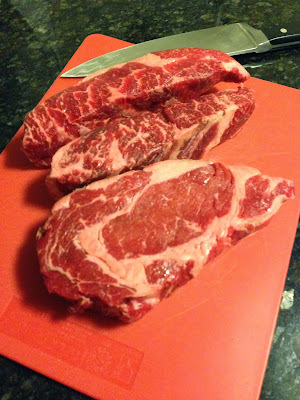 I ended up using a pound each of boneless rib eye and boneless short ribs. While the meat marinated I prepped the vegetables - carrots, celery, parsnips, and onions as well as the potatoes for the mashed potato layer. After marinating, I dried off then browned the beef, started the vegetables cooking, and reduced the red wine marinade. Instead of using beef broth I used veal demi-glace (the theme was elevated casseroles after all). I put everything in the pot along with a bouquet garni of herbs, peppercorns, and garlic and let everything braise for two hours. While the filling braised, I made the mashed potato topping which contains a liberal amount of heavy cream and butter (yum) infused with thyme and garlic. Once constructed, the final touches were a grating of Gruyère and finishing it off in the oven. The result was a bubbling dish of aromatic deliciousness. I highly recommend this recipe and it's one that I will make again and again. You'll find the link to the recipe above, I'm including it here because sometimes I find the link won't work. I'm also adding my notes of what I've changed. Enjoy! Cover the cubed rib eye with the wine and marinate for 3 hours. 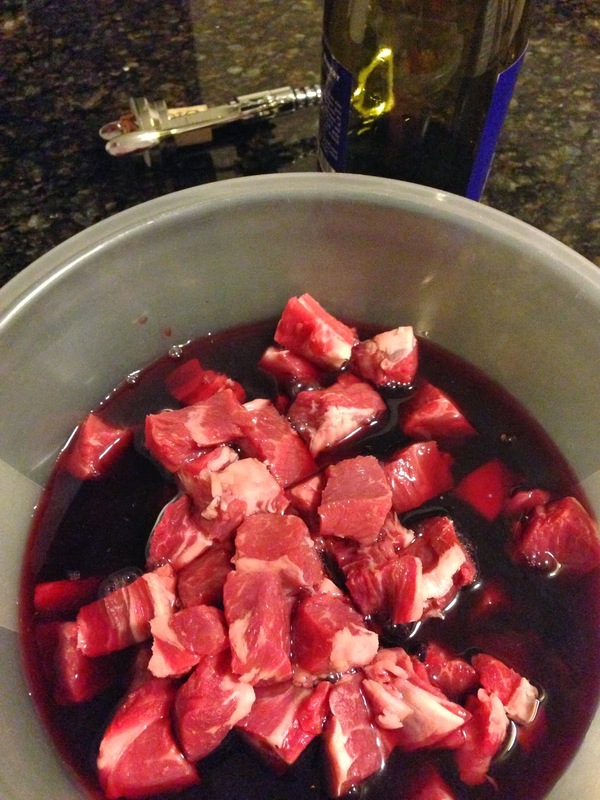 Reserving the wine in a small pot, drain the meat, pat dry, and season well with salt and pepper. Bring the wine to a simmer; reduce by half and set aside. Tie sachet ingredients into a cheesecloth square and set aside. Pour the olive oil into a large Dutch oven or heavy-bottomed pot and cook over high heat. When the oil starts to smoke, add the rib eye and sear on all sides. Transfer the meat with a slotted spoon to a plate and drain all but approximately 3 tablespoons of fat from the pot. Reduce heat to medium and add the vegetables. Cook, stirring, until the onions begin to soften, about 4 minutes. Add the tomato paste and cook, stirring for another 2 minutes. Return the meat to the pot and sprinkle in the flour, covering all the ingredients. Cook, stirring, until the flour is dissolved. Add the reduced wine, stir, and bring to a simmer, then add the veal stock and sachet, stir, and bring to a simmer again. Cover and cook at a very low simmer for 2 hours, or until the meat is fork-tender. Make the mashed potatoes while the meat is braising. To make the mashed potatoes: Preheat oven to 400°F. Place the potatoes in a pot and cover with water. Add the salt and bring to a boil. Simmer for 12 minutes, or until the potatoes are cooked through. Meanwhile, in another small pot, bring the cream, garlic, thyme, and butter to a boil. Remove from heat, cover, and rest at room temperature. Strain the water from the potatoes and return to the stove on low heat, shaking a bit until just dry. Remove and pass the potatoes through a food mill or ricer into another pot, and strain the cream and butter into the potatoes. Stir well over medium heat to combine. Season to taste with salt and pepper. Using a slotted spoon, transfer the meat and vegetables into the roasting pan or casserole dish and spread to make an even layer. Spoon the mashed potatoes on top and spread to cover. Fluff the top of the potatoes a bit with a fork to make several peaks. Evenly sprinkle the grated Gruyère on top and bake for 20 minutes, or until the top is golden brown and nicely crusted. After baking, drizzle on a touch of crème fraîche if desired. Serves 6 to 8.